Our Lady of Guadalupe has this special place in Mexican culture that I haven’t always understood. My grandmother, aunts, and uncles, would at one point or another urge me to call on her to pray for me and whatever situation I was going through. Growing up Catholic this is no surprise. But, she didn’t really move me all that much. It wasn’t until I took a class at the Jesuit Seminary at the Graduate Theological Seminary did I being to appreciate her and what she means. In this post we will learn the story of Our Lady of Guadalupe. In the next post we will learn what the story and image means. It’s actually pretty awesome! The story of Our Lady of Guadalupe is written down in a tract published in 1649 in Mexico City by Luis Las0 De la Vega. written in Nahuatl, the language of the Aztecs. Luis Laso De La Vega was a vicar at the chapel at Tepeyac. Tepeyac is the hill where the appearances took place. I am mixed race. My mother’s roots reside in England and my father’s roots are from Mexico. While my last name is Serrano, I did not inherit my father’s dark hair or features, except the lines that surround my eyes, a testimony to indegenious peoples, or so my father claims. While being so white, and benefiting from white privilege in so many ways, I straddle two worlds. I grew up in San Ysidro, California, a thoroughly Mexican community. I still remember living with my grandmother who always had different women making tortillas in the kitchen. These kind ladies were always willing to share one with me. I even admit that when they were not looking I might have stolen a couple for consumption outside on the back patio (Sorry Señoras!). I straddle two worlds because I have never really felt part of one culture or ethnicity. I was never really seen as Mexican-American by people in my community. The kids at school called us Los Guerros. And, later on, when I went to a predominately white school, I didn’t feel like I belonged either. It was an entirely different culture. By the very nature of the incarnation Jesus understands what it means to be in two worlds. He is able to fully identify with the Galileans. Jesus understands what it means for me (a White-Mexican) to be a person who doesn’t fully feel at home in any culture by the nature of my birth. 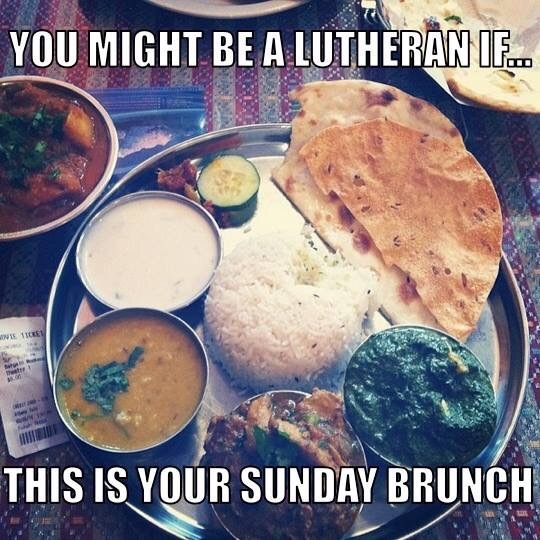 It’s interesting that I ended up being Lutheran. There is something by the nature of theology that draws me ever so closely into the primacy of God’s grace. And yet, once again, I sometimes find myself straddling two worlds. One the one side is the beautiful Lutheran theology that I have come to love. On the other side is the culture from which Lutheran theology has is roots. I think these memes should be listened to. I think people should reflect on their own understanding of what it means to be a Lutheran and show that the primary language of Lutheransim need only be theology not the culture from which it came. Lutherans, stop and listen to those who are involved in #decolonizelutheranism. They have something valuable to say. One of my earliest memories of spirituality practiced comes from my Grandma Mary. Before my family would leave for a trip she would bless my brother and I in Spanish. When she said the blessing she would first trace a small cross on my forehead, my mouth, and then give me the sign of the cross that Catholics normal do to themselves; forehead, chest and each shoulder. I would then have to kiss the hand that she was blessing me with. I remember my parents blessing me as well as my aunts and uncles. Por la Senal de la Santa Cruz de nuestro enimigos libranos Senor, Dios nuestro. En el nombre del Padre, y del Hijo, y del Spiritu Santu. By the sign of the holy cross deliver us from our enemies Lord, our God. In the name of the Father and the Son, and the Holy Spirit. Amen. Blessing is a tradition that I have done with my children. When I put my children to bed I trace the cross on their forehead and say, “Remember that you are beloved child of God.” I then ask my children to bless me. My youngest usually traces two crosses on my forehead and says says, “You are a beloved daddy of God.” My old traces one cross and says, “I love you daddy.” These are blessings I carry with me to bed. Andy Root writes about prayer, “Prayer forces us to see others as persons; it unleashes the metal claw of individualism to see personhood.” I would say that this goes for blessing as well. Blessing forces me to see my children not as objects but as subjects. It forces me to recognize their personhood. During the day when have I sinned against my children, I must apologize to them before I can bless them. I must acknowledge that I acted out of line. I have to acknowledge that the sacred space between us has been violated. I have to acknowledge it and restore it before I bless them. And, then, we are able to share that sacred space again in a blessing. Even if you are not spiritual or religious, it might be a good idea to bless your children. Tell them that they matter each night, not only to you, but to the divine, and the universe. Campaigns of mass deportations took place of many Mexicans and Mexican Americans during the 1930s. After 1931, government agencies undertook well planned deportation campaigns, feeling it was more economical to deport people than have them drain relief sources indefinitely. Coordinators for such initiatives used a variety of approaches. Locally, relief agencies might offer to subsidize the return home for those willing to accept repatriation (or they might threaten others with deportation if they resided in the country illegally; if agreed, officials organized train convoys and escorted the repatriates to the border. Church groups, associations such as the Red Cross, Mexican-American mutual aid societies, and pro-repatriation committees having as the object the humane expulsion of Mexican nationals under their own campaigns, underwrote the cost of the trek to Mexico. Castillo and De Leon, North To Aztlan (New York: Twayne Publishers, 1996), pg 87. Unfortunately, what this quotes does not tell you is that legal residents of this country were “repatriated” due to the color of their skin. Some think that up to 60% of those who were deported where American citizens. Here is a more info to read. Here is a scene from a movie I love called Mi Familia/My Family that describes what happened. A few years ago I posted a few blogs about Communion with out Baptism (CWOB). In those posts I took a stance against it. You can read earlier posts in the categories section on the right hand side. I have been rethinking this position lately. Epistemological humility should be paramount to the pastor/theologian. So, I have decided to reevaluate previously held positions and ask some questions. Questions I have to answer. Have the sacraments always been viewed in the same way? We do have two thousand years of history of theological development that has come from the church. Once Lutheran theology developed it’s understanding of the sacraments, does that mean it can’t be further analyzed and readjusted according to culture, context, and history? When I think of the atonement and how much we have moved from certain models to the current ones, it makes me think that this could be the case for the sacraments. Could the church, being led by the Spirit, be moved to re-imagine the connections between the sacraments? Can all of these questions be answered that is faithful to the witness of the scriptures? I thought tonight would be a good night to start my resolution of learning to make cocktails. 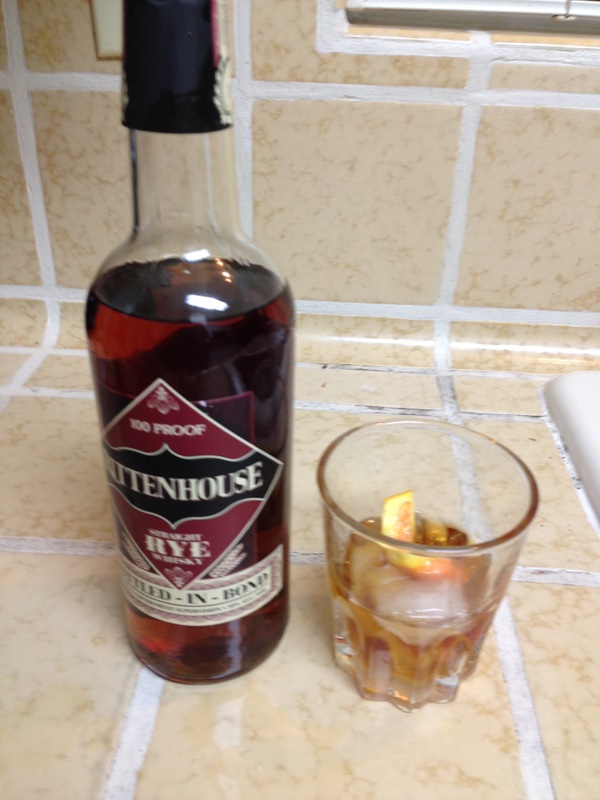 When I originally posted my intent of this resolution there was much discussion over how to make an Old Fashioned. So I decided to go with that one first! I have to thank Stacey Cullen for this recipe and instructions! Here are her instructions. Place your sugar cube in your glass, and dash your bitters onto the cube. Muddle until well combined. 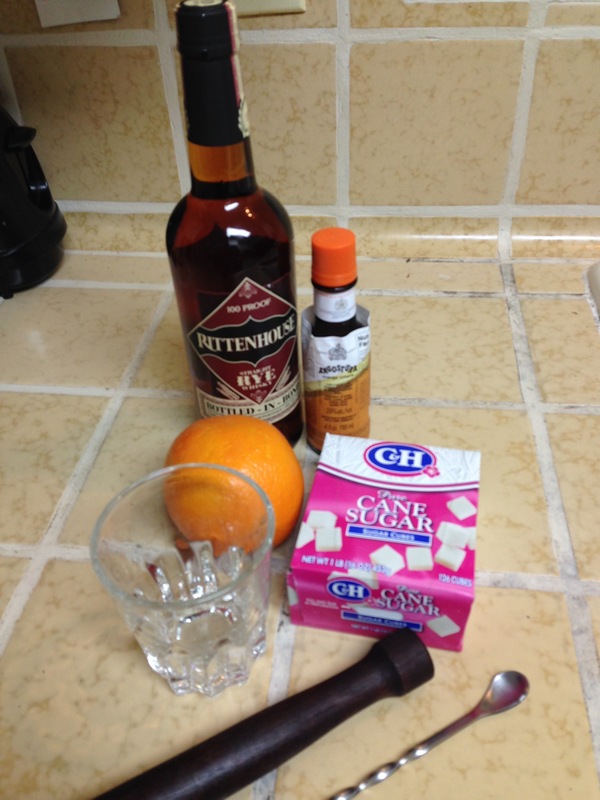 Pour bourbon on top of muddled sugar and bitters. Add one large ice cube, and give it a stir. Express your orange rind over the surface of the drink, run the rind around the rim of the glass, and place the rind in the drink for aromatics. I thought it was pretty nice tasting!